Deadpool has been on a roll lately, and he’s upping the ante this month with a bid to challenge other popular comic book team-ups such as the Avengers, the Defenders, and Heroes for Hire. Inspired after his brief stint with Luke Cage’s Heroes for Hire, Deadpool recruits the best of the worst mercenaries the world has to offer to form his own take on the Heroes for Hire. After Cage and Matt Murdock block Deadpool from proceeding with their name through the very unsuperheroic means of a cease-and-desist order, Deadpool moves forward with the new and freshly derivative moniker of Mercs for Money. That’s not supposed to sound mean, the blatant rip-off is part of the joke here, guys. 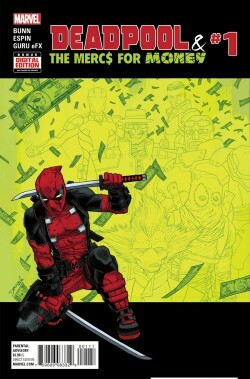 Deadpool and the Mercs for Money #1 cover. The team consists of part-time Deadpool impersonator Solo, former Avenger Stingray, living cartoon (sorry, “animated American”) Slapstick, absorbing-and-shapeshifting Terror, no nonsense Foolkiller, and Massacre (Spanish for Deadpool, supposedly). Together, they form the meanest-mouthed gang found anywhere in any Marvel book, heroes or villains. In terms of a team book, Mercs for Money doesn’t work as well immediately as any of its predecessors. This may be because many of these characters are so unfamiliar to be interesting or demanding of attention right off the bat. On the other hand, though, the book doesn’t come off seeming like a shameless cash grab or a futile attempt to popularize a lame duck. In true Deadpool fashion, Mercs for Money plays more like a parody of its fellow team-up comics. Unlike many other superhero team-ups, though, Mercs for Money doesn’t have the variety in character as its contemporaries. Like Deadpool, each of his cohorts range from gleefully insane to single-mindedly apathetic. Each of them is either batshit insane or too determined to get a paycheck to care about what else is going on. Each of them is too similar to Deadpool for there to be any kind of gripping conflict like that which makes Avengers such a successful title. Deadpool himself, as a character, has always been more interesting as a foil to bounce off of other characters around him. In this group, though, he isn’t able to bounce very far. As a leader, he starts to seem more like a blank slate than his usual self. 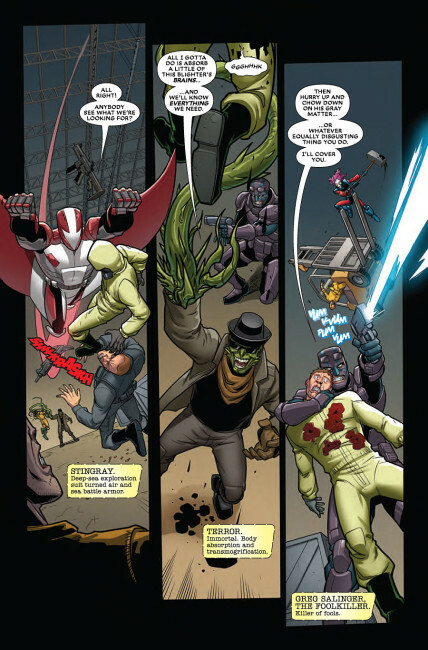 A page from Deadpool and the Mercs for Money #1. Written by Deadpool veteran Cullen Bunn (Deadpool Kills the Marvel Universe), this introductory issue does a fantastic job at remaining independent of concurrent titles and recent arcs, which remains a serious issue for Marvel books as their increasingly complex web or properties continues to expand. Unfortunately, aside from a number of silly jokes, it lacks the crude charm and snarky wit familiar with other Deadpool books. The artwork by Salva Espin is, as usual, the glowing lynchpin that keeps the whole thing together. The action flows seemlessly from panel to panel and each character is given their moment to shine. Here’s the bottom line. If you’re a lifelong fan of Deadpool, this book may be worth your time, although I imagine the lack of character on a level we’re used to from the Merc with a Mouth will be problematic. If you’re a newcomer to Deadpool or Marvel in general, then I urge you to look elsewhere for now. Perhaps Deadpool’s run under the All-New All-Different Marvel will be better suited for new comers or casual readers than this limited miniseries.